The Brothers Boswell by Philip Baruth, a Mysterious Review. 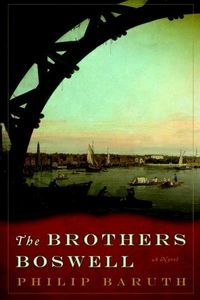 Review: Philip Bareth crafts an intriguing tale of the relationship between two brothers, one of whom would go on to fame if not fortune, in The Brothers Boswell. The elder brother is James Boswell, a real person whose primary literary achievement was the biography of Samuel Johnson, who is credited with writing the first comprehensive dictionary of the English language. The other brother is fictional, John Boswell, several years James' junior. The story is told, in part, from his perspective, as a most singular day in the life of the two young men. John surreptitiously follows James one day as he accompanies Johnson on a riverine excursion; James and Johnson are discussing current events and otherwise playing the roles of men of leisure who enjoy each other's company. Though the son of a Scottish Laird, James feels he needs the acceptance of the English elite to be complete and plots in detail how he can, and will, achieve this. John believes James is turning his back on his family, and on John in particular, to achieve a goal unworthy of him. It is on this day that John decides to test both his brother and Johnson; failing the test means a bullet through the heart for one … or both. The Brother's Boswell as a literary mystery is at its best and strongest when John is narrating. He leads the reader through the day as he follows and ultimately confronts James and Johnson, with several backstories to fill in details. There are also a few chapters that aren't narrated by John, but these seem at best supplemental, or tangential, to the primary plot. Some of the more interesting passages have to do with self-examination. Consider this early statement from John: "Finally, in the very blindest corners of the closes and wynds of this heart I have been describing to you, I came to something not unlike hate. It was unfamiliar to me at first, but eventually I began to excel at it, this something not unlike hate. And as with any unexpected talent — like painting landscapes on the blanched shell of an egg or shooting hummingbirds with a pistol — I came to cultivate it for its own sake." Though both brothers seem equal in intelligence and ability, James is clearly the more ambitious of the two. John realizes this when he says, "I was not yet seventeen, but already I had begun to suspect the worst, that there was something profoundly provisional about my time on this earth, that my own life was a journal whose pages were destined to take no ink." But, somewhat ironically, his life takes the form of a journal in the book when he says to the reader, "I detail once again my grudges, and the injuries these two men — one my own brother — have done me. I apologize for threatening to take a kind of violence, a kind of punishment into my own hands. And I swear to use these only as a true last resort, should the two of them persist in what has become their two-man conspiracy to deny my place in their lives." In many ways John's journey, as it were, is a riveting one and its conclusion especially satisfying, even poignant. Acknowledgment: Soho Press provided a copy of The Brothers Boswell for this review.